On some level, we all know that free-to-play games — and the cash shops that support them — can be a little iffy, morality-wise. Do they offer choices for time-strapped gamers? Or are they exploitative and predatory to those with no impulse control? Ask the makers of such games — while they’re still making them, at least — and 100% of them will give the first answer, while none of them will ever admit to the second. Until today, that is. 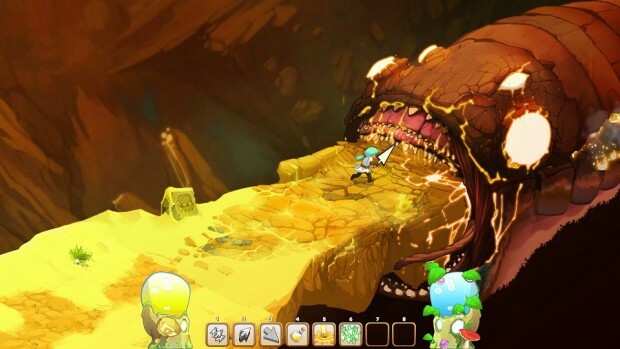 Clicker Heroes maker Playsaurus is working on Clicker Heroes 2. The original was a free-to-play game, but the second will not be, retailing instead for $29.99 (with a refund offer in place for a full year after purchase). The reason isn’t because free-to-play didn’t work; instead, it appeared to work too well, and that’s something Playsaurus is concerned about. So, out goes F2P for CH2, though no changes will be made to CH1. Kudos to Fragsworth and Playsaurus for making what had to be a difficult decision. The biggest problem I have with companies that start off F2P and then go paid, is are they going to refund all the microtransactions that occurred in the game when it was F2P? The player base will no longer have access to the gear that they paid for anymore unless they buy a legitimate copy of the game or do the monthly pay to play. Would you pay for a paint job on some else’s house. Except this one is 2 separate Games. In other words they couldn’t make enough money from F2P so they are going to sell the drug (“WE REALLY DON’T LIKE MAKING MONEY OFF PLAYERS WHO ARE IN DENIAL OF THEIR ADDICTION.”) instead ….. yeah that’s morally acceptable. Funny stuff. Not sure they thought this statement thru. 30$ for a clicker HAHAHAHA trying to outdo EA for clicks? No payment model is inherently bad or exploitative. They are all what the devs / publishers make of them. I wish people made games with good F2P model instead of trying to score easy publicity points on the trendy “F2P is too sleazy for me” topic. I agree, to me claiming this and doing otherwise is nothing more then being dishonest. Companies make money as F2P all the time. An old title I Love the F2P system is in STO (Star Trek Online), whether you had the money to invest into the game directly or would rather buy the in game currency thru the grinding process in order to buy any add-on or expansion the option is there. I’m willing to buy it, but people are going to expect more from CH2 at that price. I think the game will be met with some backlash if it isn’t better in every aspect compared to a F2P Clicker. Hopefully it turns out to be a great game and we get more games straying from the typical F2P business model. l who in their right mind would pay for a clicker game, at $30 there are many meany better games to buy. someone who is retarded enough to fall for this bs or never heard of actual games that are worth the money.